Digital iQ highlights: Become the BBC, hire a Howard, and don't drop the ball! Last Friday, Deepa and myself headed to Digital iQ, a thought-provoking marketing conference featuring the Eastern region’s top creatives, agencies and brands. What were our highlights? Kicking off Digital iQ (@digital_iq_) was Sam Wright from London-based content marketing agency Ad-Rank Media. Talking about how SEO and PR must work together in order to generate traffic over a long period of time, he also shared his advice on linking with the audience. While links are key, Wright explained that they won’t make much difference without good content. But that doesn’t mean they are no longer needed - with ‘heroic’ content, linking out from your posts should drive your pages up the search engines. Up next was Gary Gumbleton of Instant Magazine, whose job is to help businesses grow through the use of relevant content. Gumbleton offered some really useful advice for planning and structuring your video content, telling members of the audience to ‘become the BBC’ and divide their video content into channels, seasons and episodes. Using the example of BBC One’s (channel) Planet Earth (season) Epsiode 3: Jungles (episode), he explained that this tiered system is a simple and effective way to structure video content for both internal and external purposes. Next, Gumbleton suggested that the types of content created by businesses can be broken down into three categories: thought leadership, behind-the-scenes and community involvement. Whilst thought leadership videos are likely to be high-production, high-cost videos which act as an indirect sales pitch, behind-the-scenes videos give viewers an insight into the company or organisation and can be made DIY-style by filming on a mobile phone. Community involvement videos are also great for brands wanting to enhance their image, and Gumbleton used the example of Stella’s advertisement with Matt Damon, which supported Water.org, to demonstrate how firms can show they are doing good things within the community. A final tip from Gumbleton was to ‘find a Howard’. Remember Howard from the old Halifax adverts? Finding the right person with the right face and voice for the brand who is also good on camera is essential for organisations when attempting to make effective video content. Howard the Halifax man - image from The Student Pocket Guide. A talk from Ralph Du Plessis (@Red_Mud_Rookie) of Red Mud Media shed some light on how to make time for stress-free SEO and content marketing. The crowd at The Assembly House particularly enjoyed his use of GIFs and images to illustrate his points in an appropriately digital way, and he reiterated the point made by Sam Wright earlier on in the day that great content will directly affect SEO rankings and traffic in the longer term. His presentation drew to an end with some useful communication tips for agencies and clients to ensure their goals are aligned from the get go. An in-focus interview with Ben Phillips, CTO and founder of men’s fashion platform Thread, provided an additional dimension to the day by exploring how new businesses are actually using digital marketing to promote their brand. Phillips said that Thread found specific, tailored campaigns on Facebook helped to develop evangelical users in the early stages of the business. Additionally, personalised adverts and imagery were crucial when developing marketing campaigns for the startup, which offers individually tailored clothing services. Phillips also offered a top tip to budding digital marketers: stock photos may not always be effective for your product or service. YouTuber Stuart Ashen (@ashens) was next on the Digital iQ Conference agenda, offering attendees guidance on how to better utilise YouTube for business purposes. As a comical YouTuber whose hilarious product reviews have earned him over 1.2 million subscribers, he had a lot of expertise to share when it comes to approaching YouTube as a digital marketing medium. His main advice was to work with established YouTubers already in the space, but not necessarily just the big ones. By approaching smaller YouTubers to promote your product or service in their videos, your content could reach a more niche yet engaged segment of people – you just need to make sure your content fits the tone of their channel. Would it really be a conference with no mention of Brexit in today’s political climate? Wrapping up the day was Geoff Willings (@geoffwillings), founder of e-commerce software firm Evance, who discussed what might happen to VAT, export duties, exchange rate, data protection and more in the post-Brexit world. 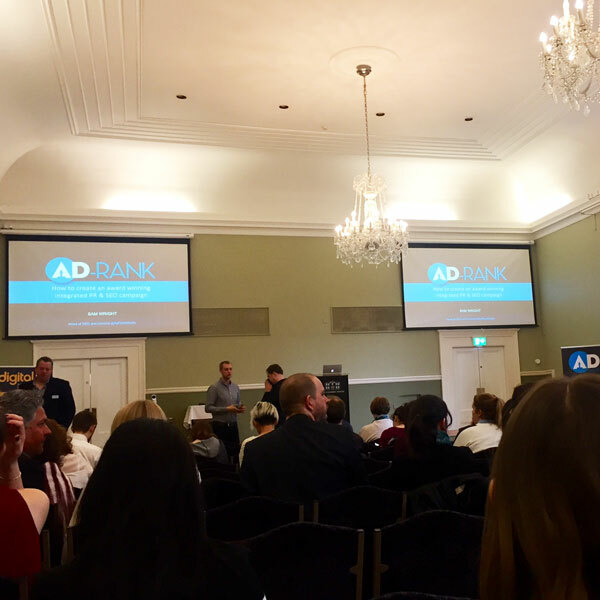 Sending attendees away with a glimpse of hope and a spur of inspiration for product or service digital marketing in the future, despite the dreary Norfolk conditions outside, Digital iQ’s first jam-packed event was a great way to end the working week. Thanks for having us in Norwich - we look forward to many more conferences to come! Which digital marketing events have you got in your diary this year? We’re always available to run workshops or speak at events, so do get in touch. What can pro wrestling teach us about content strategy?